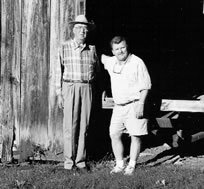 Back in the early 1900's when Cotton Grove Road running south out of Lexington, NC was just a two-lane, dirt wagon track, David Early Sink and Carrie Owens got married and settled on 110 acres of land on the edge of the Cotton Grove community. Over the next twenty years, David and Carrie had nine children of which seven survived birth. Inez was the oldest, followed by Clarence, Raymond, Archie, Homer, Maxwell, and Maxine. The farm was the lifeblood and only source of income for the family. Each of the children worked in the fields, fed chickens and turkeys, slopped hogs, got up before daylight to hand milk from six to eight cows, churned butter, checked rabbit traps and cared for the horse, which was the family transportation, and the two mules, which were the source of power for everything from the plow to the disc harrow. And when school was in session, they caught the bus after morning chores, did evening chores after school and homework after supper. There was no television or even in the early years, radio. It was a way of life that built character and instilled the work ethic that is the backbone of this country. Just a few years after he and Carrie were married, David built a barn. He used heart pine because he intended for the bam to last for years, and it has. Some of the boards are two feet wide and over twenty feet long. He put an opening on the front for each of the two mules and one in the southern lean-to for the horse. 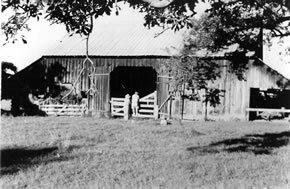 In the 1930's when David got his Ten-Twenty International tractor with the lugged metal wheels, he kept it in the lean-to on the north end. As the years passed, the children married and moved away and had more children who in turn married, and now the extended family reaches far beyond Davidson County, North Carolina. The dirt road that the children once walked down barefoot to buy penny candy at the Cotton Grove Country Store, has been paved and is now NC HWY 8. For the boaters and fishermen headed for the High Rock Lace access ramp at Southmont, the old Sink barn is a landmark, notable because, unlike so many historic old barns, the Sink bam is still in daily use. Dempsey Essick's return to the Cotton Grove community is a homecoming of sorts. It was the many requests for copies of his 1988 painting "Cotton Grove Country Store", which borders the Sink farm property, that convinced him to become a full time artist. 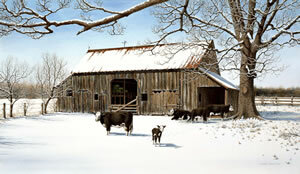 Each time he passed by on Highway eight, he would tell himself that one day he would do a painting of the old barn. Dempsey's rendering captures the essence of the structure. The heart pine boards, which are still strong, have taken on that weathered grey color that is beautiful without adornment. He has depicted the bam on a morning just after a light snowfall and the light blanket of snow serves to highlight the metal roof and the straightforward, no non- Archie Sink and Dempsey Essick sense lines of the building. Collectors of Dempsey's work know that he is at his best when depicting a subject of historical significance and he has done himself proud with this beautiful rendering of the barn located at "5148 HWY 8." No one painting in watercolor today is the equal of Dempsey Essick when it comes to depicting the texture, the grain, and the tactile sense of weathered wood. His lightly rusted metal roof and the gnarled old trees are as near perfect as is possible on a flat sheet of paper. Then, as if to remind us of his sense of humor, he has included with the livestock, a calf who has ventured forward to inspect the intruder in the barnyard, ready to turn and dash back to the protection of the mother at the snap of a finger, or the flip of a sable watercolor brush.